Wine Blog » Blog Archive » Hard Ciders from France… Wait, let me put on my Fleur de Lys hat! My daughter Melanie got tired of seeing me in my Boston Red Sox baseball hat. People believe that I have it on because I love the Red Sox. They’d be wrong. My love of the “B” hat is because I’ve traced myself back to the Reverend William Blackstone. So, why the fleur de lys? Well, Blackstone has been traced back to Charlemagne. She wants me to also pay attention to my French roots, as well as my English roots. (My maternal grandparents were Peter and Abbie Bernier… Bernier rhymes with Viognier.) So, here I am with lots of European roots. A long and winding story, and one that deserves a glass of Hard Cider from France, especially as a hard cider virgin. Winesellers, Ltd., a national importer and marketer of international wines, has introduced a selection of artisanal hard ciders. 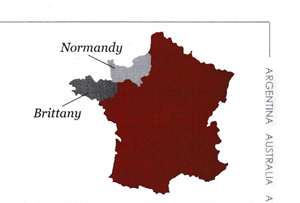 Having been produced in the regions of Normandy and Brittany, France, the area of Normandy is important to me, as my dad was on the Beaches of Normandy (June 6, 1994… D Day). Asked if I would taste, I said yes. I wanted to taste a place where I’ve never been, but my father defended against the Nazi invasion. It’s very interesting to finally discover what the hubbub is all about with hard ciders. I’ve loved hard lemonade in the past; but hard apple juice? I have to admit that I’ve never enjoyed beer, and now I know that I’m one of those wheat intolerant people. That explains to me why something so delicious for so many people only smelled and tasted like something so offensive. This reason has kept me from crossing that bridge to the brewsky side. I did have about two beers in my life, and I can remember the yeastyness in the brew. When I tasted the hard ciders, I got the remembrance of that yeast, but this time “wheat” wasn’t the ingredient… The apple flavors aromas and flavors dominated over the yeast, and it all took me on a new adventure in tasting. Something that simple… one ingredient in the mix made all of the difference in the world… between pleasure and pain. The alcohol for these ciders ranges from only three (3) to five (5.5) percent. Caution, wine lovers: It’s easy to be ready for a second glass, before you even finish the first, given the alcohol levels. Thanks, Winesellers, Ltd.. for the opportunity to sample your ciders. How did they individually taste? TASTING: This is the first of all of the hard ciders I tasted. They produce two styles: Cidre Fermier Brut (Organic Farmhouse Cidre) is a dry style; and, the Cidre Fermier Doux (Organic Farmhouse Cidre) is a bit sweet. Cidre Fermier Doux (Organic Farmhouse Cidre) ~I have to admit, as a novice, I preferred the Cidre Fermier Doux. It’s like being a kid and going from a diet of milk into water and then segueing to juice. The child will pick the juice over the water any day. Our palates are born to enjoy lactose. If it didn’t contain lactose – for energy – I can only imagine how boring milk would be. I feel this way about the hard ciders, for now. I know as I try more, my palate will become accustomed to the flavors and enjoying a drier version, just as my wine palate changed from sweet to dry. ~ Joie de vivre! STORY: Mandoir de Grandouet is a third generation family farm, located in the heart of the Pays d’Auge, Normandy. They harvest 70 acres of cider apple orchards. Eighty dairy cows graze under the apple trees, later to have their milk used for AOC Camembert cheese production. The Cidre Fermier Brut ($11.00) and Cidre AOP Pays d’Auge ($13.00) will be available nationwide through the Winesellers, Ltd. wholesaler network. Cidre Fermier Brut... A great cider for those among us who love beer. This one was the closest to beer of all the hard ciders in this story. All I could think was ~ Tres bien! STORY: The Le Brun ciders have been produced in Brittany, France, since 1955. The ciders are made using the traditional method of natural fermentation, from pure pressed juice of their handpicked apples. 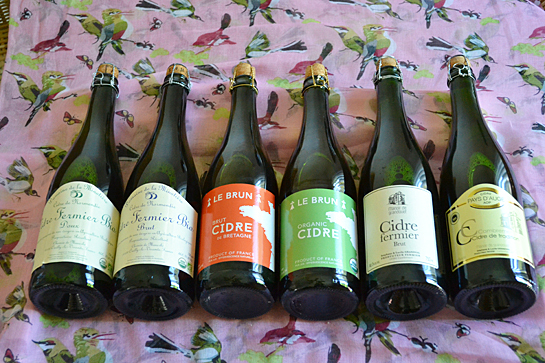 The Le Brun brand includes the Brut Cidre de Bretagne ($9.00) and the Organic Cidre – certified USDA ($10.00). Both will be available nationwide through the Winesellers, Ltd. wholesaler network. The labels are what will pull in the newbies, the millennial, the early adopters, regardless of age. The look is simple, clean, and shows location, location, location. For your info, each hard cider is available for the first time in the US, with the selection including two single domain farmhouse producers in Normandy and one traditional method producer in Brittany. You can contact Winesellers, Ltd. for more information.